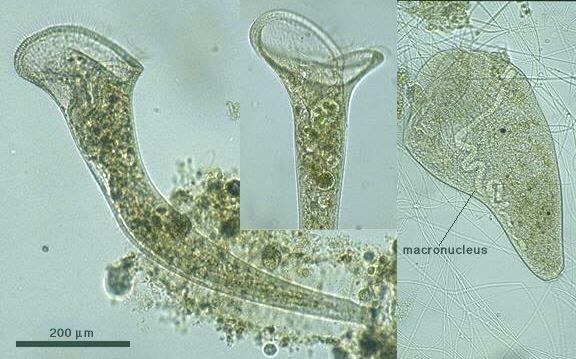 Genus: When extended, trumpet-shaped or cylindrical; highly contractile; some with mucilaginous lorica; conspicuous peristomal field frontal; contractile vacuole anterior-left; fresh water (Kudo, 1966). Species: 0.5-1 mm long; anterior end expanded; body surface with groups of longer cilia; posterior portion drawn out and often within a gelatinous tube (lorica); macronucleus long band-form (Kudo, 1966). Body attenuated, peristome widely expanded, attains 0.5-1.0 mm; peristome has no central raised dome; somatic bristles present; gelatinous lorica; macronucleus moniliform but usually observed as a long rod; colourless (Carey, 1992).